The White House has said talks are underway with North Korea over the possibility of a second summit between United States President Donald Trump and Kim Jong-un after the North Korean leader sent a "very warm" letter. The first meeting was held in Singapore in June. "President has received the letter from Kim Jong-un. It was a very warm, very positive letter. We won't release the full letter unless the North Korean leader agrees that we should," White House Press Secretary Sarah Sanders told reporters at her daily news conference on Monday. "The primary purpose of the letter was to request and look to schedule another meeting with the president, which we are open to and are already in the process of coordinating that," she said. Sanders said the recent parade in North Korea, for once, was not about their nuclear arsenal. The president has achieved tremendous success with his policies so far. And the letter was further evidence of progress in that relationship, she said. 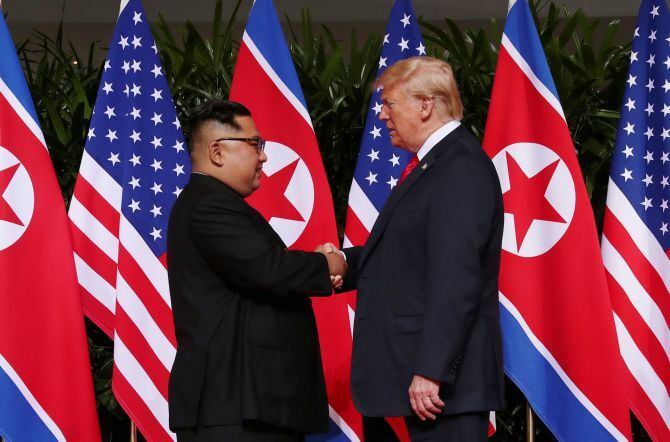 "A number of things that have taken place: The remains have come back; the hostages have returned; there's been no testing of missiles or nuclear material; and of course, the historic summit between the two leaders. And this letter is just further indication of the progress that we hope to continue to make,” Sanders said. She said the White House wants the meeting to take place. "The letter from Kim Jong Un to the president certainly showed a commitment to continuing conversations, continuing to work on the progress that they have had since their meeting just a few months ago. And also, a continued commitment to focus on denuclearization of the Peninsula," Sanders said.